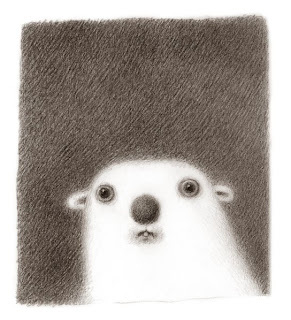 polar hog? i can't stop laughing. i want a polar hog. My first thought was "I want to kiss its muzzle". But then I noticed the way it is staring at my throat with that one tooth. So a yellow flag went up in my mind and I thought "no, I will not kiss that muzzle. Best to be cautious with a polar hog". Still cute, though. oh my gossssh! he's too cute. is he scared? I want him for Christmas.